The Sierra Nevada Logging Museum has an extensive array of donated artifacts of all sizes. In the last year or so, (2010 – 2012) through the efforts of Bill Kafka and Ted Shannon, our outdoor exhibits have been organized and displayed appropriately. This has resulted in in the whole area being much more attractive and informative. Adding to this is signage produced by Exhibit Coordinator, Mike Skenfield, that allows visitors to lean about the equipment on their own. Our outdoor exhibit area really looks good! Some of our artifacts are quite rare. One of the largest, a Willamette “steam donkey” weighs approximately 66,000 pounds. 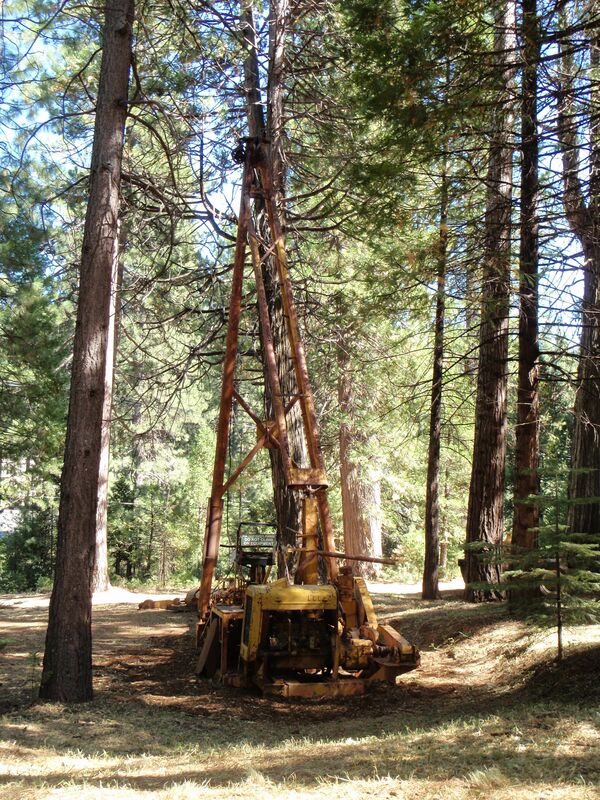 Built in 1916, it was last used near Cherry Lake in Tuolumne County and was donated by Sierra Pacific Industries. We received a gift of what we were calling a “Gin Pole”, but is properly called a “Jammer” Getting it to our museum from Dutch Flat was a complicated process, because it is a big and very heavy piece of equipment. Then getting it into its designated space on our grounds involved some complicated maneuvers on the part of Steve Kafka using a big log loader borrowed from the K.W. Emerson Company. This is the jammer in place. Getting it back to looking like it did when it was working is yet to be completed. A difficult job. This jammer was built to specifications and to meet certain needs as outlined by the lumber company that ordered it. Thus there is no other quite like it. This article from our archives describes the use of a jammer at the Stockton Box Mill in West Point. There are three crawler tractors on the site, ranging in size from a small gas-powered Caterpillar Model 30 to a Caterpillar Model 75 diesel. The 75-diesel is rare, being produced only a few years before CAT changed its designation to D8. Crawler tractors replaced steam donkeys for skidding logs. A third tractor, a CAT-D7 was our latest Caterpillar acquisition. This tractor is of particular interest to us because it was used by Maury Rasmussen at his mill in San Andreas and later in his mill at Chinese Camp. He then used this CAT to help build the Mt. Reba ski resort. 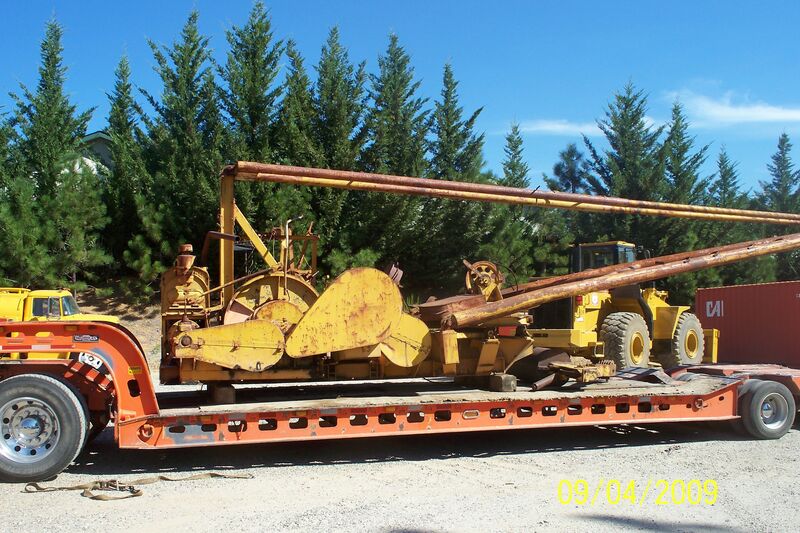 It was later sold to Gary Petts who used it in his logging operation, and later he donated it to the museum. It ran when donated, but years later when we needed to move it, we got the starter engine going, but never were able to get the diesel engine running. Three logging arches displayed at the Museum site (and dating from various periods) were used to raise one end of logs off the ground, reducing drag and the “nosing in” of logs as they were pulled along the ground. 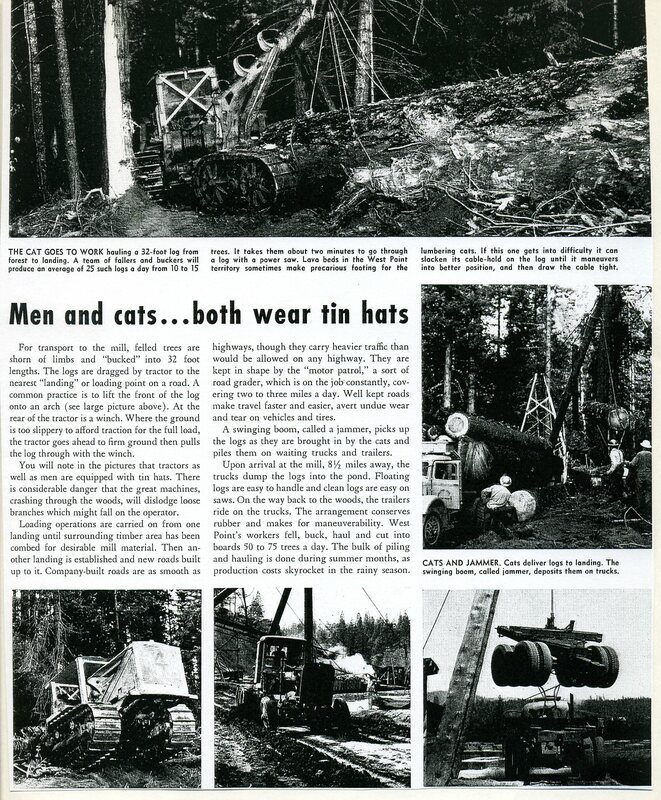 A logger’s cabin, portable sawmill, a circular 40-foot band saw (two edged) and other large equipment are displayed. Also a lumber carrier, an antique Adams road grader, and a Shay locomotive, our largest, heaviest artifact, are also on site. Have you been able to locate a log car to go with your Shay? I noticed you were looking for a flatcar. Would a logging bunk style work also? Paul, yes, a logging bunk style would work great. Right now, we have an offer from the rail museum in Portola for a flat car. In return they want our Shay guy to mill some lumber for a project of theirs, and we have to find a feasible and not too expensive way to get it down to us. It will need a lot of work if and when we get it.